Disorders of the peripheral nervous system (PNS) are the cause of prominent neurological symptoms including weakness, sensory loss, pain and autonomic dysfunction associated with deficits, morbidity and mortality. These disorders may be primary hereditary or cryptogenic neurologic disorders confined to the PNS or part of the pathology of both the central nervous system and the PNS. Most PNS disorders are secondary to other system disorders and may be responsive to treatment of the primary disease. Important advances have been obtained in several areas including molecular genetics, biochemistry, immunology, morphology and physiology that have enhanced our understanding of the causes and consequences of damage to peripheral nerve. Understanding of both these groups of PNS diseases has greatly expanded over recent years and has led to important advances of treatment both to protect and to repair damages of peripheral nerve. 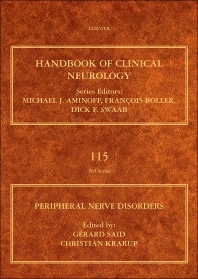 This volume provides an overview of the state-of-the-art of examination, diagnosis and treatment of these very diverse disorders and will be of interest to both the research and clinical neuroscience and neurology communities.